We spent much of week two of our three weeks out west in the warehouse district of Los Angeles. I was shocked at how large LA’s homeless population is. I was also a bit shocked as how bad the area smelled – stale urine, extreme heat and no rain to wash it away is not very pleasant. It is really a sad scene given the overall wealth of our country and of SoCal in particular. An interesting real estate related concept in LA was the number of what appears to be privately owned SRO (Single Room Occupancy or rooming houses) Nice, modern buildings. So even in this most economically, and probably socially, challenging housing environments, rental owners are able to find workable solutions by providing housing uniquely suited for a specific population. Every year we spend about three weeks in the southwest. Typically it starts with four days at a database developer conference, this year and last were in Vegas. While I was honing my computer skills, my wife offered some classes and coaching for her Vegas area students of the Event Decorating Academy. We then rented a car and headed to Los Angeles to reconnect with vendors that supply the Event Decor Mart. Carmen put on a couple of more classes and coaching sessions while in LA. The trip ends in Vegas for the ASD trade show. In general, I do not like Vegas. It is expensive, and we are not gamblers or night people. Although one night I did stay up to 11 PM;-) It is also triple digit hot every day. I always return with a lot of new database techniques and skills. More importantly to this conversation, I am a constant student of the housing industry, taking every opportunity to learn something while away from home. We rented furnished apartments in both Vegas and LA through Hotels.com. These are units that the property management has set aside just for this purpose. If you have mid to upscale rentals, this might be an opportunity to increase your occupancy. It appears the going rate per week is around the half the monthly rent, plus a $100-150 fee per rental for cleaning. Renting an apartment for extended work trips is a heck of a bargain for the consumer. The cost is half that of renting a hotel room in the same area. Plus you get a full kitchen to make your meals, which is important given Carmen’s extreme food allergies, and a washer as you are not going to make it three weeks without doing laundry. In LA we stayed in a one bedroom at the Apex, just a block or so from the Staple Center. The Apex is a modern glass high-rise with a good sized living room, which Carmen needed for her coaching sessions. In Vegas, we found a place half a block from the Convention Center – two bedroom, two baths, kitchen and laundry with a large living room for far less than the cost of a Vegas hotel. From an owner’s perspective, weekly furnished business rentals could help owners of mid to upper-end apartments in high demand areas increase their collected rent. I’m sure AirBnB also fits in here. Municipalities often oppose things like weekly rentals and AirBnB because they cut into the hotel tax revenue. So if you are going to give this a go I would check local ordinances as well as with your city’s taxing authority to make sure you stay on this side of the law. To be successful at landlording you must approach it as a business. No better way to be innovative than to liberally steal ideas, grabbing the best from other industries and repurposing them for ours. I also have been thinking a lot about starting an incubator for physical businesses in Milwaukee that employee people that have a hard time finding good jobs. 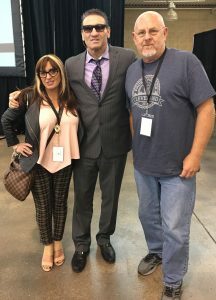 This past Saturday John Lee Dumas, who does the podcast “Entrepreneur on Fire” was speaking at the inaugural Young Entrepreneur Convention in Des Moines. If you have heard his podcast you know how great they are. If you haven’t, go take a listen. His format is doing an interview a day with a different entrepreneur, seven days a week. He is an ex-tank commander in the Middle Eastern wars, turned successful podcaster and author. I find such valuable insights in his stuff that I decided to go to Iowa to see him in person. I did not even look at who the other speakers were. After hearing him speak, if the Young Entrepreneur Convention been JLD alone, the trip would have been worth it. I was pleasantly surprised at the quality of every one of the presenters. Probably the best known was Kevin Harrington, one of the original Sharks from Shark Tank. His interesting story: He got his start after seeing a knife pitchman at a county fair and noticing that the Discovery Channel was dark six hours a day in the early days of cable. This was the beginning of “As Seen On TV” and the entire infomercial craze. 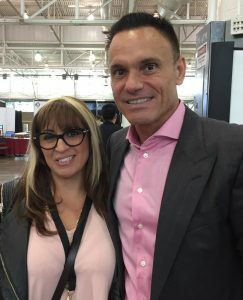 Carmen spoke to Kevin Harrington off stage about doing a promo for the Event Decorating Academy. I think what he offered is a valid idea to try. The other surprising presenter was Jeff Hoffman, founder of PriceLine.com, the company that brought low-cost easy travel to the masses as well as the creator of the airport ticketing kiosk. There was some irony in seeing him Saturday and then having a terrible experience with American Airlines on the way home the next day. His interesting story: He got kicked out of Yale for not having the complete tuition. He solved it by creating a B2B software company even though he could not program himself at the time. 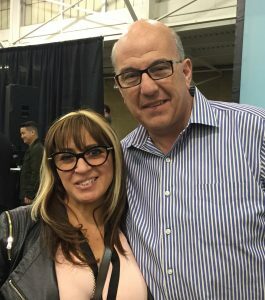 Two big take aways from Jeff Hoffman: Create BIG goals, envision that you have achieved them and then work backward each step until you are where you are today. That is how he arrived at doing concerts with Elton John, Britney Spears, and NSYNC. He also has produced a profitable indie movie. The other, which is a to our businesses, is to look at what is occurring outside of your industry and see what opportunities presents themselves. PriceLine.com was based on his reading articles on perishable goods, distressed inventory, and spot pricing. As I wrote earlier, every presenter was great. The guy that put the event together was Brandon T Adams. He had created the (3rd?) largest Kickstarter campaigns and is a 2012 Iowa State University grad. Two of the presenters are from Madison. Megan Watt ,who just released her first book, is a leadership trainer at her company, Dream Catalyst Labs. I paged through the book after hearing her presentation and bought it. The other is Jenna Atkinson, who gave a great presentation on marketing and social media. Cactus Jack Barringer is a very entertaining marketer. Guy holds a dozen patents. There were a bunch other presenters during break out sessions that I did not get to see. You can see the YEC 2016 speaker list here. One that we did see that I did not see a tie into our businesses but was cool to meet as our son-in-law and his brother are both MMA fighters, in fact, Monday of last week the brother, Kevin Vazquez, had his first major UFC fight was Ken Shamrock “The World’s Most Dangerous Man”. Shamrock and his partner were pitching a project to team retiring celebrities with young entrepreneurs. The event was so great I can’t wait for next year’s conference.